Figures presented at a Cabinet meeting paint a rosy picture and ignore reality. A government get-together in Turkmenistan this week was a predictable smorgasbord of half-truths, untruths and self-reassuring fantasies. The ostensible agenda of the August 3 Cabinet meeting overseen by President Gurbanguly Berdymukhamedov was to discuss the "work of the economic branches [of government] over the past seven months.” There should have been much to talk about given the rampant inflation, food shortages and all manner of concomitant problems. Instead, it was the usual medley of dubious figures. For example, the government claimed growth over the reporting period stood at 6.2 percent while the “overall production” increase was 4.4 percent. Given that GDP is a measure of overall production, perhaps what was meant by overall production was real GDP, which accounts for inflation. That would put inflation at a measly 1.8 percent, far below the 100-plus percent inflation estimated by the Cato Institute’s Troubled Currencies project. The Cabinet meeting further saw an announcement that average monthly salaries were 9.1 percent higher this year than last. This would certainly indicate inflation above 1.8 percent, but even if the data is accurate, it likely fails to consider that the Turkmen manat has fallen significantly on local black markets over the past year. Figures issued at the Cabinet meeting also indicated that state enterprises increased their output by 3.6 percent, with profits rising by 50.2 percent. While energy prices are indeed up, the vast majority of Turkmenistan's sales are in gas to China and the contractual terms are unknown. The Turkmen government’s reticence to ever release any actual data makes its boasts impossible to verify. It may be that Ashgabat is simply padding the figures, as an August 6 report from the exile-based Chronicles of Turkmenistan would indicate. The outlet investigated claims made by state media that the country is to begin producing 100,000 computers for children to be ready for the New Year. The report, however, pointed out that the electronics will be produced in China and that only the assembly of plastic cases would take place in Turkmenistan. 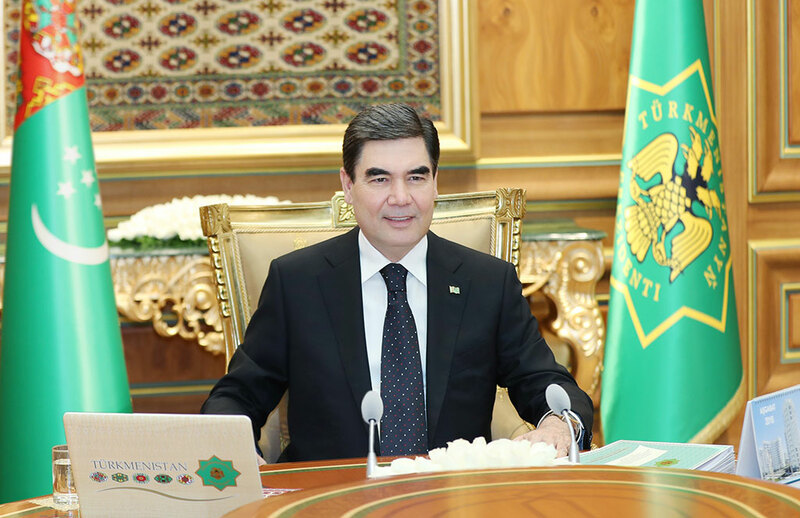 One particularly outlandish, Soviet-style claim made in the Cabinet meeting was that Turkmenhimiya, the state chemicals company, is exceeding the plan twofold. This is particularly interesting in the light of the opening of the Garlyk potash mine and plant last year. An August 1 press release printed by Marketwatch, which claims that Garlyk is struggling with water inflows, reports that the plant "is said to be producing at a rate of about 100 thousand tons per year (a 7 percent utilization rate)." Perhaps the utilization rate did double from 3.5 percent, but that is little cause for celebration. TDH also reported on August 2 that Akhmet Gylychurdyev has been fired as chairman of the Turkmenbashi State Commercial Bank for unspecified “serious deficiencies” in his role. Lest one think that major changes are in the offing, Gylychurdyev's deputy, Jumagalych Jumagalyjov, was appointed in his place. Refusals to comment on the country’s actual challenges – indeed on any genuine unpleasantness – are certainly in the vein of what is to be expected from Turkmen state media. For example, an August 1 editorial that TDH ran on Turkmenistan’s contributions to international efforts to support Afghanistan did not once mention the conflict there, let alone the fact that clashes have taken place along the Turkmen border. Chronicles of Turkmenistan and another exile-based outlet, the Alternative News of Turkmenistan, released articles this past week that provide a better look at certain aspects of the economy. One article highlights the challenges facing small- and medium-sized business owners and claims that conditions are so poor that the main shopping centers in the capital are more than half-empty. Those businesses that are operating largely depend on government connections. And the stores that do have customers, as Chronicles of Turkmenistan documents with a photo of a store called Kaml Markets, experience shortages of basic staples like sugar. Alternative News of Turkmenistan outlines how Turkmen citizens are required to obtain a “certificate of non-conviction” in order to secure employment. The report highlights the significant difficulty in doing so and the lack of online services. It also notes that typical bribes demanded to secure the documents are around 400 manat, some $113 at the official exchange rate, though closer to $20 at prevailing black-market rates. Such certificates are also required for Turkmen traveling abroad, just one of many of the government’s restrictions on its citizens’ right to travel. In the latest such injustice, Chronicles of Turkmenistan reported on July 31 that 19 passengers, who it claimed were all school graduates hoping to study in Turkey, were barred from boarding a flight from Istanbul six days prior. No reason was given for barring their exit. The same outlet has previously alleged that Turkmen citizens under 40 suffer from a blanket ban on their right to travel out of the country, although it noted in early July that this prohibition appeared to have been lifted. The latest report raises concerns this ban is back in place. Berdymukhamedov did order efforts to boost foreign trade at his Cabinet meeting. But there has yet to be any follow-up on last week's reporting that Turkmenistan and Iran were near an agreement to end their gas dispute. Nevertheless, SNG Today, which is based in Russia but regularly lavishes Turkmenistan with glowing coverage, noted that Turkmen Deputy Trade and Economic Relations Minister Karar Mammadov met with his Iranian counterpart, Mojtaba Khosrotaj, on August 3 and they discussed efforts to enhance trade cooperation. Akhal-Teke is a Eurasianet column compiling news and analysis from Turkmenistan.